URDUGA IS A RUSSIAN MANUFACTURE OF PROTECTION SYSTEMS FOR HIGH-PRESSURE HOSES, PNEUMATIC HOSES AND CABLES. Urduga LLC is Russia’s leading manufacturer of protection systems for high-pressure and pneumatic hoses against mechanical damage. The company’s expertise is based on the close teamwork of its marketing, research, and production teams. Quality: cutting-edge equipment, quality control at all production stages, in-house laboratory and testing department enable developing a product for delivery to the assembly lines of the major mechanical engineering plants. All necessary certificates for use in various industries available. Delivery performance: large product warehouse, automated production, and a well-developed feedstock base help fulfill an order in the shortest time. Responsibility: timely delivery of the highest quality products to our customers. Flexible pricing: our offering will meet expectations of our customers, from large industrial sites to small workshops. 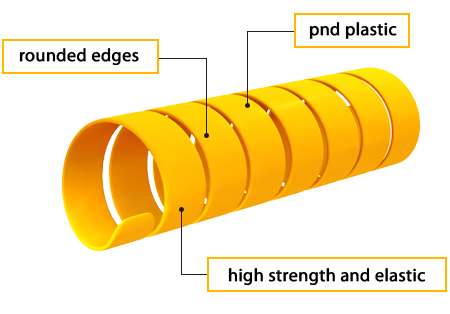 You will always find a wide range of plastic spiral protection, metal spiral protection, textile safety hoses, thermal protection hoses of various diameters in our product catalogue. It is designed to protect various types of high-pressure hoses and cables from impacts, hooks, friction, exposure to corrosive media and ultraviolet, which significantly increases the service life.